You can use the personal tax planner to better understand your personal finances and estimate the amount of income tax you may need to pay. If you’re aiming to avoid paying higher rate taxes by staying below the threshold, this is a great way to help see your position. The calculator is meant only as tool to help you quickly assess your personal tax status and advice must always be sought from a professional financial advisor before making any decisions. None of the data inputted into the calculator is saved or used by inniAccounts. It is important to appreciate that what you do in the online application day to day is about maintaining your company and its accounts. 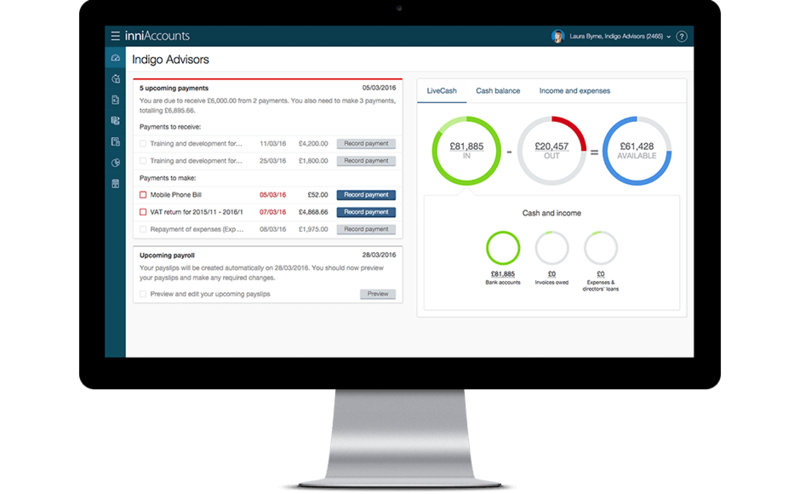 LiveCash is designed to give you a detailed insight into your company tax position. The personal tax planner is independent of your company taxes as it is about you as an individual – personal taxes are subject to different rules, rates and thresholds. Don’t forget that personal taxes are calculated based on the tax year, i.e. 6th Apr to 5th Apr. The information the online application has about your income is used by the calculator to help you see your personal tax position relative to the higher rate tax threshold. When you issue a dividend you will see the calculator. The calculator shows you ‘Your higher rate tax starting point’ for the current tax year, over which any income received is likely to be taxed at the higher rate. It will display your ‘Estimated earnings this year’ from your salary payments and the ‘Dividends paid to date’. To this you can enter your estimates of ‘Additional income’, i.e. bank interest, rental income, etc to improve the accuracy. The calculator then shows you what additional dividends can be drawn without having to pay higher rate tax. You then have the option of entering a figure for ‘Additional dividends to be paid’ and if you pass the higher rate threshold you’ll see the ‘Estimated higher rate tax due’. If your earnings do pass the threshold and higher rate tax becomes due, it will need to be reported on your Self Assessment Tax Return. This additional tax will need to be paid by you personally to HMRC when your Self Assessment is submitted at the end of the tax year. It is important to ensure that you understand the figures in the calculator to ensure they reflect your personal circumstances. For example, the ‘Estimated earnings this year’ should be the sum of your salaried income for the tax year from previous employment plus any salary you expect to earn going forwards be it through your company or elsewhere.